Subaru’s redesigned 2015 Outback all-wheel-drive wagon starts as low as $25,745 including destination, but the tested 2.5i Limited started at $31,145, ending up at $34,207 with several optional safety, comfort, and infotainment features. Subaru deserves some credit for the deft way it has straddled the car/sport-utility-vehicle divide for a number of years now. On the one side is the Forester, shaped like a compact SUV but not too far removed from the driving character of a passenger car. On the other side is the Outback, a midsize station wagon with a bit more ground clearance and other aids for getting at least a little way off the beaten path. 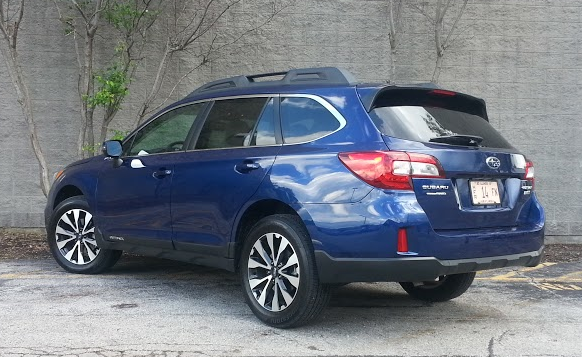 The Outback has a higher ride height than a midsize car but is less bulky than a midsize SUV. We found it provides positive features of both with few of the drawbacks. Those shoppers who like the idea of an SUV but realize they really need a car 355 days out of the year can get a Forester. Meanwhile, car customers who know a little extra capability comes in handy 10 days a year can pick an Outback. It’s a win-win for Subaru. Ingenious. Of them, it was the Outback that Consumer Guide® editors most recently had the chance to drive. 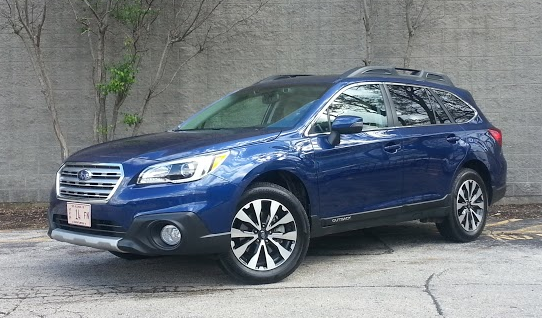 Like the Legacy sedan, to which it is related, the Outback is redesigned for 2015. Key improvements are a more-refined interior, enhanced fuel economy, passenger- and cargo-room gains, and new infotainment and safety features. The same 2 “boxer” engine choices—a 2.5-liter 4-cylinder and a 3.6-liter 6-cylinder—return with the same horsepower ratings, but an automatic-like continuously variable transmission (CVT) is now the sole transmission offering. This tester didn’t ask anything of CG’s Outback Limited other than to get him between work and home a couple times. At that it excelled. The Outback handles nicely with a highly compliant ride. It’s hardly a cushy cloud, but the same kind of road-surface jolt producers that rock some other cars we test—over the very same routes—were handily stanched by the Outback. We didn’t need it this time, but “X-Mode” traction-assist system with hill-descent control is standard, one of the things that makes the Outback a little more able in places where civilization is in the rearview mirror. Power from the 175-horsepower 4-cylinder hooked to the CVT is good, not great. A stint of 108.3 miles, 75 percent of them from city-style driving, averaged an underwhelming 20.80 mpg. Consider that the EPA city figure for the 4-cylinder Outback is 25 mpg. At least in 2.5i Limited trim — the top of the 4-cylinder lineup — the Outback impresses inside with rich materials and a two-tone color scheme. The control layout also drew praise. Except for the different rooflines that change head room and visibility, the Legacy and Outback have similar passenger compartments. The plushed-up Limited displayed soft-touch surfaces on much of the door panels and dashboard. Satin-silver plastic trim on the center stack and woodgrain sections on the dash and doors added to the appearance. CG’s tester had an attractive 2-tone interior scheme with supportive and comfortable perforated-leather seats that are standard at this level. Head room is good front or rear. Drivers and front passengers can find all the stretch-out space they need. Rear occupants have fine adult leg room—front seat backs are deeply sculpted to maximize the space—but the driveline hump is prominent enough to limit comfortable seating to 2 grown-ups. A 7-inch central touchscreen governs the audio system and optional voice-activated navigation. An external tuning knob makes it easy to access radio stations (though it’s a reach to the far side of the touchscreen from the driver’s seat), and a press on the screen at the appropriate spot saves them. Controls for the dual-zone climate system rely on a few function buttons, but rotary dials govern the temperature settings. Digital time and temperature readings register on a small screen that doesn’t play well with polarized sunglasses. The back of the center console holds buttons for the standard rear seat heaters. Interior storage starts with a decently sized glove box, door pockets with bottle holders, a deep padded-top console box with a change tray, and dual open cupholders in the console. A bin covered by a pop-up door where the console meets the dash contains auxiliary and USB inputs. Rear door pockets are just big enough for a bottle. Other storage includes pouches on the back of each front seat. A pull-down center armrest contains 2 cupholders. 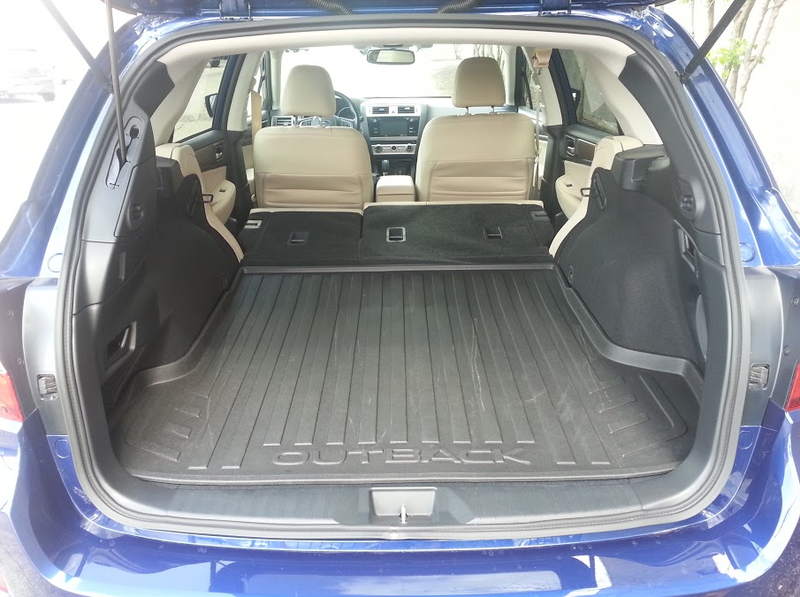 Outback boasts plenty of convenient cargo space, and our tester included a rubber floor liner, tie-down hooks, and a 12-volt power outlet in back. A wagon should provide plenty of cargo-carrying capacity, and the Outback does. The ample cargo area loads at bumper height onto a molded mat with troughs deep enough to trap dirt and water. Tie-downs and a power point are provided in the cargo area. When the rear 60/40-split seats are folded, they do so almost perfectly flat. Seat backs can be dropped via remote levers in the cargo area or with flippers built into the seats. 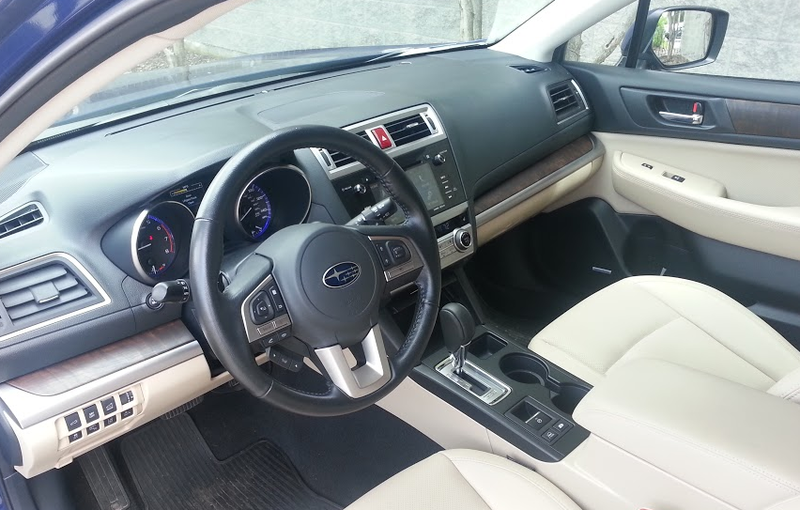 Other standard features included in the Outback Limited’s $30,295 base price are the usual Subaru all-wheel-drive, a rearview camera, blind-spot detection, rear cross-traffic alert, privacy glass, roof rails with cross bars, a power liftgate with memory function, Bluetooth connectivity, Internet and satellite radio, and remote keyless entry. CG’s test car was augmented with more than $3000 in options, including a megapackage that brought a moonroof, push-button starting, navigation, and electronic safety features, for a fairly lofty price of $34,207 with delivery. However, the essentials that make the Outback a little more than the average station wagon when necessary are still available at lower price points. Written by: The Daily Drive staff on June 2, 2015.on March 22, 2019.